You may or may not have been in scouting previously, but feel that scouting is for you. Obviously you will need the support from other adults in order to set up a scout group. This is where the association may be able to help. We do get enquiries from across the country from people wishing to start a scout group or to join a scout group but find that there is no group in their nearby area. The process of starting a new scout group is quite simple, but to be successful requires time, dedication and a motivation to help the young members achieve the most that scouting can provided. You will find that you will gain as much from being a Scouter (leader) as the young members gain from it. It is a continuing learning process; no Scouter knows everything about scouting, we all learn more with the more we put in to motivate the young members. The great thing about our training programmes are that they are traditional, tried, tested and well documented and illustrated, progressive and easily understood by the young members and those who were in the Boy Scouts previously; so you may consider that you lack knowledge but I can assure you that you will soon gain this knowledge. Our training courses will also give you that greater confidence, along with our other Scouters who are always available to assist you and give guidance. Are there children of the age groups needed to form a group? Both boys and girls can join any of the scout group sections. Beavers - 6 to 8 years of age. Wolf Cubs - 8 to 11 years of age. Scouts - 11 to 15 years of age. Senior Scouts - 15 to 18 years of age. Rover Scouts - 18 years onwards. You will require a minimum of two Scouters in order to start a scout group, and you may decide initially that you are only able to run one section, which of course is no problem but the ultimate aim should be for the development into a full group. Scouters must be at least 18 years of age to be warranted as assistants and 21 years of age to become a Scout Master, Wolf Cub Master or Beaver Master. Lady Scouters are given the titles of Lady Scout Master, Lady Wolf Cub Master or Lady Beaver Master. Where and when can your new group meet, what costs are involved and how are these to be funded initially? The Association strongly recommends that group should try to obtain sponsorship of a church or similar establishment. This helps with our safety policies for the protection of children and young people because the Scouters and helpers within the group will be well know by the sponsoring body. Sooner or later you will need to form a Group Committee to assist with fund raising, and other general administrative matters, comprising of a Chairperson, a Secretary, and a Treasurer. Your Scouters and regular helpers will be required to undergo a CRB/D&BS check, read and understand our current "Child Protection Policy Statement", and also our "Equal Opportunities Policy Statement". Scouts will also need to complete a "Warrant Application" form and our "Protection of Child and Young People" declaration. Once you have a two warranted Scouters and insurance in place, we will be able to issue a "Temporary Group Registration Certificate" that will be valid for one year, after which we will be able to renew this with a "Full Group Registration Certificate". 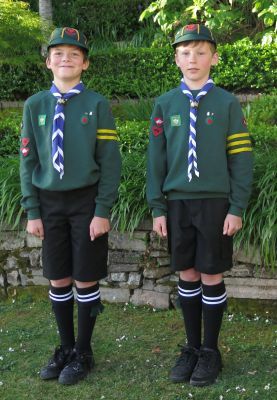 Uniform and badges are held in stock by the Association trading section "Scoutwear". Uniform and badge price lists and order forms are available on request. Uniform and badges must be paid for before they can be dispatched. Scouters should have full uniform from the start, but it may take time for the complete group to be fully uniformed. Some scout groups in their scout section, run a lease uniform system, details of the leasing scheme is available on request. For each young member you will be need a form providing personal details of the member, along with a health statement or form, and emergency contact details; all to be completed by the parents or guardians at the earliest opportunity. Subscriptions need to be set at a level that will cover the weekly outgoings of the scout group, to cover uniform if applicable, and a small surplus for incidentals that may occur from time to time. Fund raising is essential if the scout group is to gain all the equipment it will need to fully function. Occasionally, some scout groups may have surplus kit that they could donate to new forming groups. There are many ways to fund raise and ideas can be supplied on request. We do run the annual "Bob-A-Job" on the original lines set for this; it is a great opportunity for all sections of the scout group to provide community service, and greatly appreciated the local community and good for the image of scouting, as well as bringing in funds for the scout group. The commissioners of the Association are there to provide you with all the assistance that you might require and to guide you through the registration process. They will visit you if required, particularly at the start up meeting to meet parents and to invest your new Scouters, to assist in planning and running the first meeting. Once your scout group is up and running, they can make themselves available to give advice, answer any queries, provide sample meeting programmes, and keep you informed of any Scouter training courses available or events and activities to be shared by the scout groups of the association. We are here to serve and assist you and your new scout group.